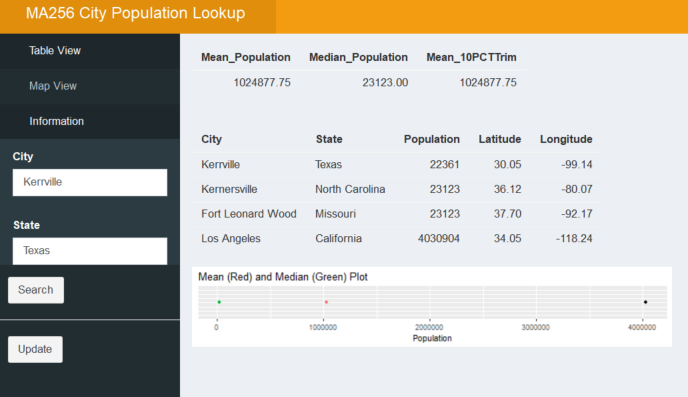 This Shiny App aids instructors in teaching introductory statistics students the appropriateness of using Mean/Median/Trimmed Mean with their hometowns. Allows the student to type in their home town/state. The App scrapes the appropriate hometown off the internet. The town's population and lat/long are saved into a google sheet. The App Reads off the googlesheet and returns the data in a chart. After clicking update, the hometowns plot on an interactive map. The mean/median/trimmed mean of the hometown's population is presented. The instructor can use this interactive tool to teach an important introductory concept with student's personalized data. This topic was automatically closed 50 days after the last reply. New replies are no longer allowed.